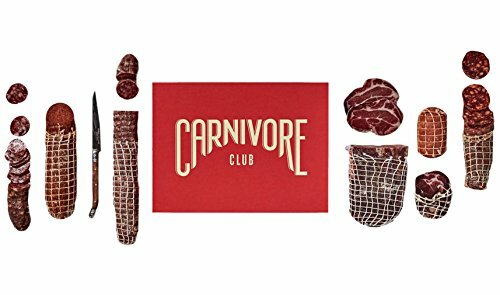 Carnivore Club is the world's first cured meat of the month club featuring artisans from around the world. Carnivore Club celebrates the individual recipes of each cured meat savant, no two meats are alike even when similar in name. Don't purchase items that are doomed to be the next re-gift. You are the most thoughtful and impressive gift giver your inner circle has ever known. There is no better way to impress the discerning foodie than a gift of the world's finest artisan charcuterie. Warning: Your gift recipient may look at you with that "damn, you're awesome" stare afterwards. Own it. You win. Carnivore Club gift, checkmate. We feature items like Spanish Chorizo, Bresaola, Toscano Salami, South African Biltong, Prosciutto Americano, and many more! Take a look at images for Examples of Past Boxes and the Delicious Meats we Feature! If you have any questions about this product by Carnivore Club, contact us by completing and submitting the form below. If you are looking for a specif part number, please include it with your message.